This is the perfect pudding recipe to celebrate any functions or festivals. 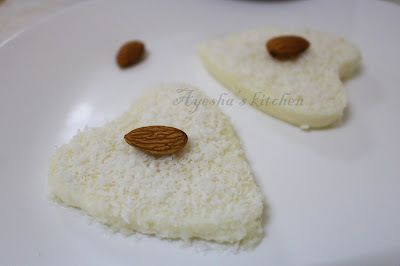 I love to deal with desiccated coconut recipes for making desserts. The combination of desiccated coconut, whipping cream and fresh cream gives this pudding a melt in mouth texture. Both kids and adults equally love this creamy rich dessert recipe which is very easy to prepare. 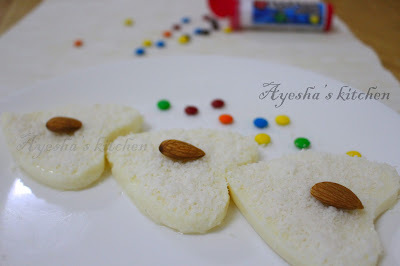 This is my favorite coconut pudding dessert recipes which i made for this Eid. Anyway, Christmas is coming closer. Do not forget to try this yummy pudding recipe which can even lighten up your Christmas treats / Christmas meals. Whisk the whipping cream well till fluffy. Then add cream to it and whisk again. Pour the condensed milk and mix well. Soak the china grass in cold water for few minutes and then cook over a slow flame until it dissolves to a clear liquid. Add the prepared china grass liquid to the mixture and again beat well. Now, finally add the desiccated coconut and mix well with a spatula. Pour it into a pudding tray. Keep refrigerated for 1 hour. You can decorate with nuts, desiccated coconut or caramelized nuts.